NASA and The LEGO Group have announced an agreement that will literally send a LEGO Space Shuttle into orbit on November 30th, 2010. It would have went up this week, but the STS-133 shuttle mission that would have launched the Discovery into space, had to be temporarily delayed through November 30th due to some needed repairs. This month’s launch will be the Discovery’s last mission. 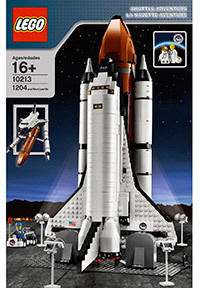 The launch of the LEGO space shuttle is meant to interest children in science, technology, engineering, and math. A LEGO space shuttle headed to orbit helps mark the Tuesday signing of a Space Act Agreement between NASA and The LEGO Group to spark children’s interest in science, technology, engineering and math (STEM). To commemorate the beginning of this partnership, the small LEGO shuttle will launch with the crew of the space shuttle Discovery on its STS-133 mission, targeted to launch Wednesday, Nov. 3, from NASA’s Kennedy Space Center in Florida. The LEGO Group will release four NASA-inspired products in their LEGO CITY line next year. The space-themed products will vary in terms of complexity, engaging audiences from young children to adult LEGO fans. Each product release will contain NASA-inspired education materials. 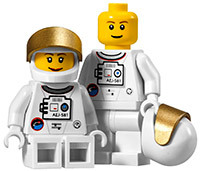 While it’s ostensibly for the children, a major result of this is that the LEGO City line for 2011 will be expanded to include four NASA-themed LEGO sets, and the press release mentions that at least one of the sets will be targeted towards adult LEGO fans (AFOLs). The press release mentions a “small” LEGO shuttle. I don’t know what their definition of “small” is – there is an existing/current Shuttle set in the Creator line, the 10213 Shuttle Adventure, which is still available through the LEGO Store or retailers like Amazon.com. That set has 1,200+ bricks in it.. If you check the official LEGOSpace.com website (see below), there are some photos with a very small shuttle. Most likely that will be the size. Update: The smaller Shuttle you see at the LEGOSpace.com website below is the proper size. There will be a really unique event in February of 2011. There will be special LEGO sets flown up to the International Space Station (ISS) aboard the shuttle Endeavor on the STS-134 mission. These are actual sets that are not already assembled, and astronauts will assemble them in orbit while children and students assemble similar sets across the US (and world?). It will help the children visualize what it’s like to build something in space.